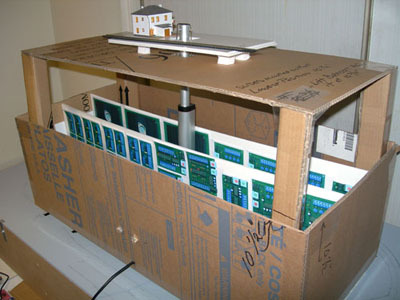 The lift mechanism is now complete and operational; however, before it was built, a full-size mock-up was assembled out of the finest quality scrap cardboard. 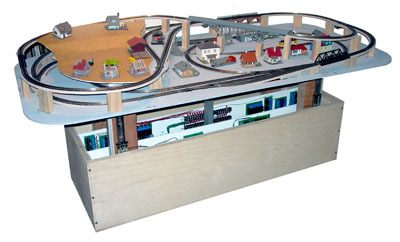 The mock-up included the “equipment box” that houses the lift mechanism and the layout's electronics. (The equipment box is located in the base of the finished coffee table.) The mock-up along with detailed dimensional drawings provided the cabinetmaker with enough information to produce the finished product. Sitting on top of the lift mechanism mock-up (above) is a small layout mock-up that includes one house and one piece of track. 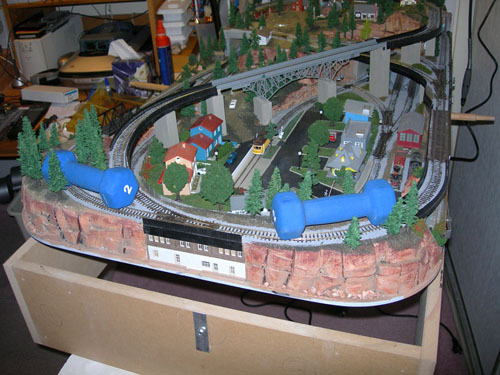 The layout mock-up indicates the elevation of the first track level in the finished layout. Note that the top of the linear actuator (tall gray cylinder) protrudes through the layout. This was not desirable, but it was necessary. The shortest available linear actuator was about 1.5 inches too tall for the layout. 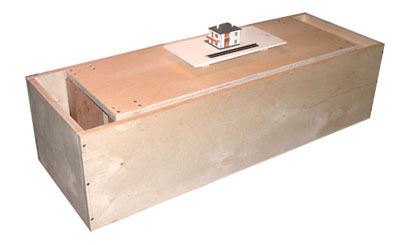 A house, water tank, or some other appropriate piece of scenery would have to be placed over the top of the linear actuator to hide it. Also note that the mock-up of the equipment box includes two long white foam-core boards with circuit board images on them. This is where the actual electronics modules would mount in the finished table. the photo below shows the finished lift mechanism and equipment box assembly—along with the small layout mock-up. The lift is in the down position. In this position, the layout will be inside the coffee table, below the wooden top and/or glass. The layout can be operated in this position, with or without a glass top. 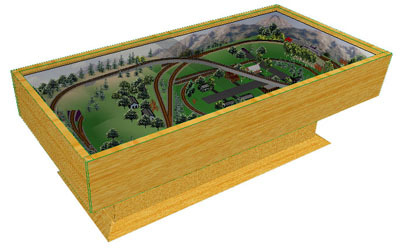 The 3D computer model (below) illustrates the layout operating in the lowered position under glass. With the wooden top and glass removed, the layout can be raised 6.5 inches, so that it appears to be sitting on top of the coffee table. In the photo below, the actual lift mechanism is shown in its raised position. 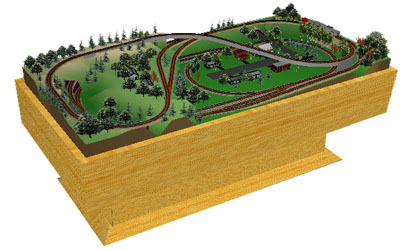 The 3D computer model (below) illustrates the layout operating in the raised position. The final photo (below) shows the actual layout, which was in the early stages of construction, resting on the lift mechanism in the raised position. The electronics modules, also under construction, can be seen in the equipment box. Power supplies, not visible in the photo, are located under the electronics. 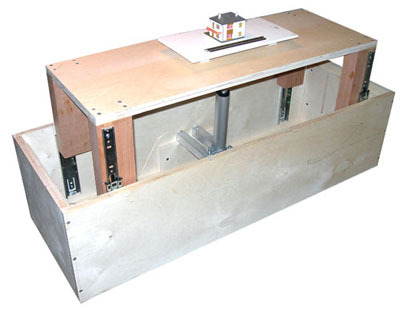 Eventually, the finished layout and the equipment box containing the lift mechanism, electronics, and power supplies would be housed inside the coffee table. One easily overlooked aspect of the lift mechanism is that smooth operation requires an evenly balanced load. In other words, the layout must not have one end (or one side) that is much heavier than the other. 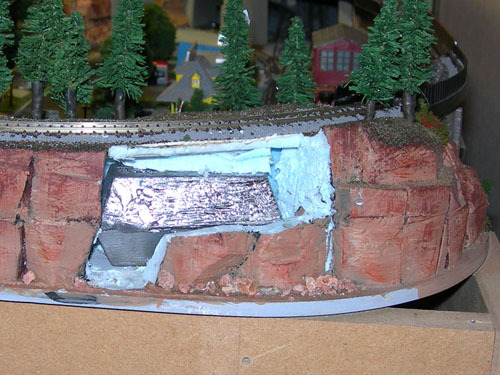 In the case of this layout, the end with the tunnels was significantly heavier than the other end. To measure this difference, I placed the layout on a dowel, as if it was a seesaw. The dowel was located at the exact center of the layout. Then, I added weights to the light end of the layout until the layout was approximately balanced on the dowel (see photo below). Four pounds added to the lighter end was sufficient to balance the layout. A similar balancing act in the side-to-side direction showed that the table was only slightly heavier on one side than the other. I concluded that this slight difference could be ignored. Four 1-pound lead ingots provided the perfect solution to the end-to-end balance problem. The ingots were small enough to fit inside the foam rock formations at the corners of the table. Minor surgery along existing fault lines in the rock formations, followed by scooping out some of the interior foam, provided the perfect space for the ingots. 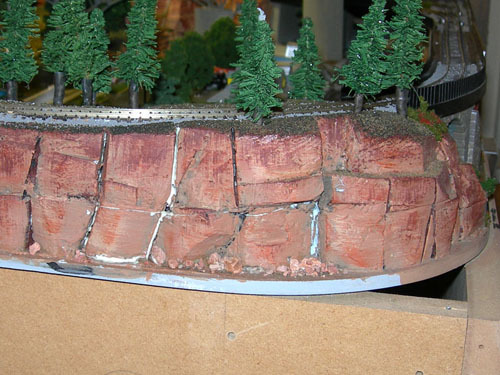 The rock formations were easily glued back in place. All that remained to be done at that point was a quick repainting of the fault lines.